For a decade now Freeport has stood as one of fantasy gaming's most distinctive cities. Home to pirates, foul cults, terrifying monsters, vicious gangs, crime lords, and corrupt politicians, Freeport is a dynamic setting that offers a unique blend of high adventure and cosmic horror. Now the City of Adventure returns to its roots with the Freeport Companion: Pathfinder RPG Edition, a rules supplement for the Pirate's Guide to Freeport. Its 160 pages are packed with all the support you need to run a Freeport campaign with the Pathfinder RPG. 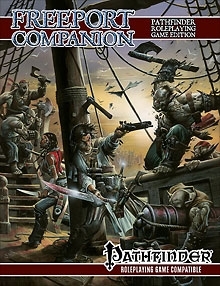 In addition to giving game stats for all the city's major characters, the Freeport Companion provides new core classes like the corsair and monster hunter, new prestige classes like the musketeer and witch hunter, famous magic items, an insanity system, new spells and incantations, and an introductory adventure. Celebrate 10 years of the City of Adventure with the Freeport Companion: Pathfinder RPG Edition! Please Note: If you want to take advantage of the Print + PDF pre-order special, you'll need to head on over to the Green Ronin website. If you just want the PDF, you're in the right place! This title was added to our catalog on August 24, 2010.